PMiNet (Performance Management & integration Network) is a scalable Financial and Performance Management Software product designed to support a wide range of contract types and management environments. The product can be configured for simple budgeting and cost tracking or fully configured for Earned Value Management and cost/schedule integration in compliance with ANSI/EIA-748 standards. Other fully integrated applications support rigorous NASA Financial Management and 533 reporting requirements. The product also supports NSA requirements for Funds Management and Funds Status reporting. The software is designed for flexibility, ease-of-use and data integrity. It can be easily installed to run standalone on your individual workstation or in a shared LAN environment supporting remote internet access for interactive Resource Planning and forecasting. Read more about our PMiNet Solutions. Business Support Associates provides software, services, integration tools and dedication to implementing fully integrated solutions for financial management, earned value management and compliance with other government reporting requirements. We work closely with project teams to develop an in-depth understanding of contractual requirements. Our goal is to minimize complexity and streamline the effort required to meet demanding reporting requirements and deadlines. Business Support Associates builds long term relationships based on commitment, dependability, capability and results! We look forward to becoming part of your team and having the opportunity to contribute to your success. Actual cost is collected and accumulated in the Repository. >>> >>> Actual cost is collected and accumulated in the Repository. Cost is typically imported from the corporate accounting system. Interfaces are available for major accounting systems including Costpoint®, GCS Premier® and SAP®. Others are easily configured. The system provides reconciliation tools and maintains audit trails to ensure data integrity. Resource Plans are developed to assign the resources needed to perform each Task. >>> >>> Labor, material, travel and all other costs are included. Resource Plans are consolidated and integrated into the Repository to establish the Performance Measurement Baseline (PMB). 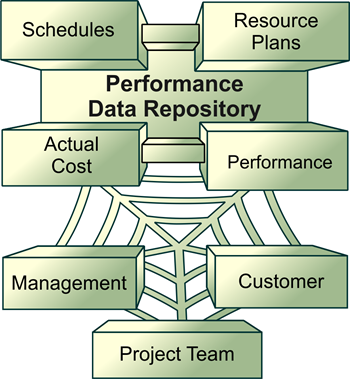 As work is completed Performance is computed and Earned Value is recorded in the Repository. PMiNet computes Performance based on the cumulative progress recorded for each Task/work package. >>> >>> Progress may be entered simply as a percentage or tied to Task starts and Task completions using one of the start/finish methods (0/100, 25/75, 50/50, etc). Performance for Level-of-Effort work packages is computed by the system. Performance status for discrete milestone methods can be recorded electronically from schedules or entered manually. Project schedules are accessed electronically and integrated into the Repository. >>> >>> When using Resource Loaded schedules Resource Plans can be taken directly from schedules and integrated into the Repository. Progress of work performed is recorded from key Earned Value milestones.